Cornwall Yoga retreats right on the beach! 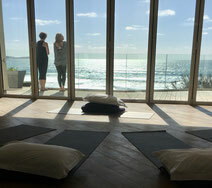 Come and join us at this award-winning and effortlessly stylish Cornwall beach-side hotel, for a truly memorable Yoga break in Cornwall. Set on a spectacular surfing beach on the North Cornwall coast, this is the perfect destination for a contemporary uplifting yoga holiday. Drink in the calming view of the ocean as we practice; relax in the welcoming comfort of the hotel afterwards and explore some of the best coastal walks and activities in between sessions. Energising morning Yoga and deeply relaxing evening sessions will boost your mood and work to strengthen as well as release your body. One of the highlights is a soothing candle-lit session on Saturday evening as well as bespoke yoga workshops tailored to the group. The programme we've developed is completely unique and has been carefully planned with this exquisite hotel to give you something very special both as an experience in itself and with specific tips and techniques to develop your Yoga. Whatever your starting point, we will leave you refreshed, full of new ideas and empowered to implement them. Please book direct with the hotel who will advise you on availability and optional extras. You can select your room and weekend package to meet your own unique preferences - with the option for adding treatments such as massage and reflexology and activities like surfing - with use of the hotel's breath-taking pool, sun deck and hot tub all included. *space permitting. Priority given to hotel residents.